on the Eritrea Constitutionthat the dictator didn’t want to implement. how the dictatorship killed the free press. The third part is dedicated to the prisons, military camps, schools. Many street children, who have no family, are taken into the military system even though they may be well below 18 years of age. That these children are then trained as soldiers, that they become hardened soldiers often used to carry out nefarious acts. In post liberation Eritrea it is easy to disappear. It is not only adults that disappear, children also disappear. Children are collected from the streets and are taken to makeshift prisons. Of this I have a personal experience as I had taken a special interest in a young boy assisting him to return to school until one day he went to school and never returned home. We all looked for him for months only to find out that he had been arrested and that he was in a prison not far from Asmara. The prison was a stable guarded by military. Many of the unaccompanied minors who are now in refugee camps in Sudan and Ethiopia are children who have not been able to obtain from the Eritrean Government the necessary papers for family reunification as well as young herders who in the past would have been assisted to re-enter Eritrea with the support of such organisations as ICRC – a programme that the Eritrean Government has stopped. Human Rights is Eritrea is a four letter word in other word it is considered a dirty word. This is despite the fact that the Eritrean Constitution clearly aspires to abide by international standards of human rights. This antipathy toward the application, within Eritrea, of Human Right standard did manifest itself as early as 1990’s when the Regional Centre for Human Rights Development was ordered to be closed. The Centre was established by Mr Paulos Tesfageorigs former chairman of the Eritrean Relief Association (ERA). Following the closure of the Centre Mr Paulos was held under house arrest for 3 month Mr Paulos was part of a group of 13 (G13) Eritrean intellectuals who in 2001 protested the management of the country by President Isaias. – Taha Mohammed Nur businessman and member of the Constitutional Commission died in captivity no formal charges were ever laid. – Abdu Ahmed Younis (87 at time of arrest) the father of Ali Abdu Eritrea’s Minister of Information (acting) was arrested in December 2012 as retaliation against the defection of Ali Abdu – one of President Isaia’s henchmen. This is the second time that papa Abdu is arrested – he was one of the Elder arrested in 2001 when the Elders attempted to mediate between the protesting politicians ( G 15 group ) and the President. Also arrested were: (a) Mr Hassen Abdy Ahmed (38 at time of arrest) the brother of Ali Abdu. Hassen Abdy has been in the National Service since the mid 1990’s; (b) Ms Ciham Ali Abdu daughter of Ali Abdu and 15 year of age at the time of the arrest. It was well known in Asmara that Elder Abdu did not approve of the way that Abdu Ali was unquestioningly serving the President of Eritrea. – Idriss Abara – Director General (Welfare) of the Ministry of Labour a veteran liberation hero was arrested the first week of October 2001. He had openly criticised the Government’s mother tongue policy for primary arguing that it would further marginalise minority groups. are not able to raise issues of Human Rights that could be perceived to be criticism of the Government . 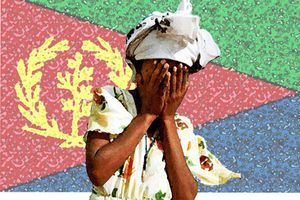 Hence the National Union of Eritrean Women’s has never raised the issue of gender based violence with the armed services or the SAWA military training camp and is in fact becoming less and less relevant to young Eritrean Women who do not see the organisation as addressing their issues. For the National Union of Eritrean Youth and Students (NUEYS) raising issues of the arrest and detention of children by police and other armed forces has proved very difficult if not impossible bearing in mind the fact that many arrests arise as a result of street children living in the street and working as street vendors as well as the fact that young men and women are refusing to report for national service. The National Confederation of Eritrean Workers (NCEW) is also impaired in its work of defending workers’ rights as the Government is the biggest employer and the whole development programme (Warsay Yiekalo ) is based on cheap labour of conscript and is completely antagonistic to the principles of the trade union movement. The continued harassment of independent Eritrean professionals and business people constantly facing unfair competition from government enterprises that are not subject to the provisions of the Eritrean Labour law , required to pay back taxes, unable to renew licences in a timely manner, threatened with arrest, and generally hindered in the practice of their profession. It is often the case that is not possible to renew licences unless relatives in the diaspora also pay 2% tax. Many professionals have been arrested held for months without trial with the result that their business is destroyed. In most case during the period of arrest most of them were never questioned or informed of the precise reason for their arrest. Since 2008 licences to practice law have not been renewed this means that existing legal offices are in jeopardy and no new legal offices can be opened. This approach further undermines the existence of the legal profession. The Eritreans in the diaspora who were members of the Eritrean Liberation Front ( ELF) were not allowed to return to Eritrea as members of the ELF. In fact at the ELF was not allowed to exist within Independent Eritrea. In 2008 national staff of international NGO as well as the ICRC staff were arrested many taken from their place of work The main reason for the arrest was that the staff concerned had not done their national service. This irrespective of the fact that most of the staff had been employed before such provisions started being enforced. It is also interesting to note that nobody mentioned the difficulty NGO had in making the legally (Eritrean Labour Law) required termination payments to their staff. In 2012 international NGO’s left Eritrea. At the start of the year the Ministry of Labour and Human Welfare asked that all the international NGO terminate all their projects by end of December 2012 irrespective of the timelines of the projects. At the same time organisations such as the National Union of Eritrean Youth and Students, National Union of Eritrean Women were put under pressure as to their access to independent funding for their projects. These actions resulted in Oxfam GB, LWF, Norwegian Church Aid, and Irish Refugee Trust closing it also impacted on the Eritrean organisations. 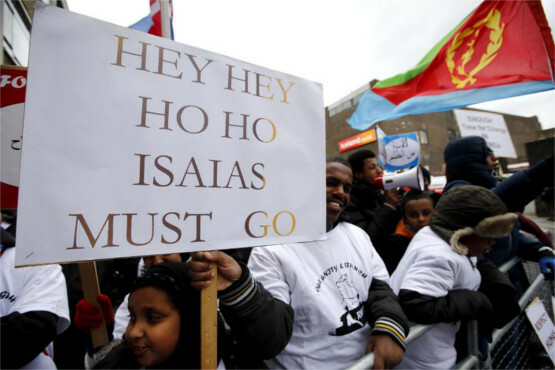 The decisions that were taken at the highest level of Government with little to no consultation with the line ministries or other Eritrean Organisations that were to be impacted. The decision took no account as to the number of Eritreans that would lose their jobs. Nobody mentioned the number of national UN staff that has been arrested. I know of cases where such staff was arrested during their leave period so that the UN would not notice they were missing. In fact there is no reference at all to the 2001 arrest of national staff that was working for the Embassy of the United States of America or the fact that on a number of occasions National working for the UN staff has been denied exit visas for training purposes or for purposes of pursuing an international career. There is no mention of the freezing of senior national UN staff preventing them from travelling outside of the country.